While there have been some exciting games over the first two days of post season play, including historic pitching performances by Roy Halladay and Tim Lincecum, there have also been too many examples of bad umpiring. In the Yankees vs. 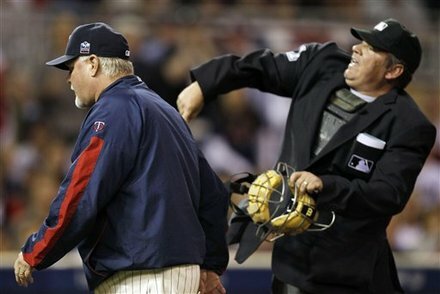 Twins ALDS, game one was witness to an erroneous trap call on a Greg Golson running catch that otherwise would have ended the game. The missed call didn’t impact the outcome because the next batter was retired, but it was exactly the kind of play that riles replay advocates. In game two of the series, much of the attention was shifted to Hunter Wendlestedt’s “creative” strike zone that seemed to shift home plate six inches toward third base when a lefty was at the plate. Although Wendlestedt’s alternative zone actually favored Twins’ starter Carl Pavano, that didn’t stop much of the focus from being on one missed call against Lance Berkman, which was followed by an RBI double on the next pitch. In the first game of the Rays vs. Rangers series, a pitch that seemed to scrape off the fingers of Carlos Pena was ruled a foul tip, turning a run scoring hit by pitch into an eventual strikeout. Then, in game two, Michael Young appeared to offer at a third strike, but his somewhat obvious attempt was called a check swing. Young then deposited the next pitch over the centerfield wall. Finally, in last night’s Braves vs. Giants NLDS, Buster Posey scored a run in the fourth inning on a single by Cody Ross. Posey was on second base at the time thanks to a stolen base earlier in the frame. The only problem, however, was the replay showed that Posey was tagged before reaching the bag. Naturally, the run proved to be the only one scored in the ballgame. Surprisingly, while Ron Gardenhire and Joe Maddon were both ejected in their respective games, Bobby Cox didn’t even leave the bench to argue the missed call on the Posey steal. Adding further irony, only the latter play would have been reviewable under most current proposals, so it’s very likely that neither of yesterday’s controversial calls would have been reversed even if there was expanded instant replay. Still, that hasn’t stopped the hue and cry for baseball to abandon the “human element” in favor of technological solutions. 1) With one out, Buster Posey is on first and Freddy Sanchez in on third. On a swinging strike three, Posey attempts a steal of second base, but is called out to end the inning. On the play, Sanchez had broken for home, but the attempt was rendered moot by the out at second. After looking at the replay, however, the tape reveals that Posey was actually safe. Now, what do you do with Sanchez? After all, if the infielder had known Posey was safe, he might have thrown home to nab Sanchez. The easy solution would be to send Sanchez back to third, but then than penalizes the Giants in the event that Sanchez was going to score. As a result, replay will have either created another inherently unfair situation, or opened another matter to umpires’ judgment, which is precisely what replay is trying to avoid. 2) The Twins have runners on first and second with no outs when Jim Thome lines a smash to Greg Golson in right. Golson snags the ball before it hits the ground, but the umpire rules a trap. With the runners going on the pitch, Golson hurriedly tries to nab the slow footed Thome at first, but launches the ball in the stands, allowing one run to score. On further review, it is revealed that Golson actually made the play. Had the incorrect call not been made, however, the Yankees could have had a double or even triple play. Then again, Golson might have been making the same throw to first, so perhaps the overthrow should stand? What should be done with the runners? Again, the aftermath of replay is still going to leave one team feeling victimized. The potential situations that could throw a monkey wrench into a comprehensive replay system are many. That doesn’t mean a more limited application can not be explored. While those options are being weighed, however, major league baseball would be better served by developing a more comprehensive and transparent rating system for its umpires. In fact, that’s exactly what the MLBPA seems to now be advocating. Back in June, I proposed such a system, writing, “it’s come time for MLB to develop and make public a rating system for its officials. Just like players must face the daily scrutiny of their performance, the officials who oversee the games should as well. 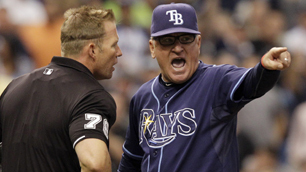 Even if it means a labor conflict, it’s time for baseball to impose more stringent requirements on its umpires.” The players seem to be on board. Now it’s up to Bud Selig and his owners. Holding umpires to an increased level of accountability is the best way to ensure quality officiating. Then, and only then, should expanded replay be implemented. Otherwise, baseball will only being giving its umpires a crutch without actually trying to heal them.